Board director Shad Johnson participates in CEI's Spacelab. 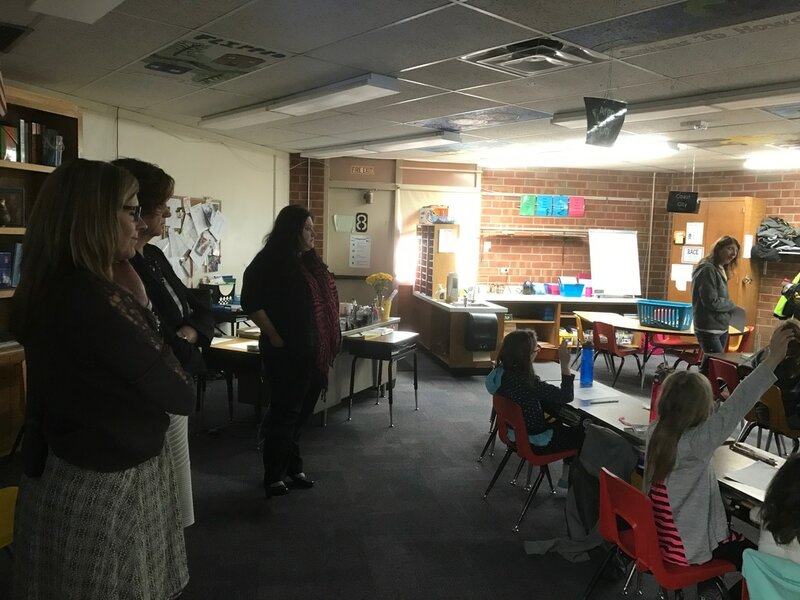 Two weeks ago Cañon City School District board of education director Shad Johnson had the honor of participating in the Colorado Education Initiative’s new Spacelab project. Spacelab is a series of next generation professional learning opportunities offering key educators and leaders the opportunity to share promising education practices up close. The project features three strands; networking, design thinking, and seeing is believing. CEI’s hope is that by getting educators to creatively engage with each other, they will become well equipped to tackle the myriad challenges they face. Mr. Johnson was granted one of a highly limited number of spots to participate. I want to thank him for pursuing this opportunity and sharing what he learned. Last week several Cañon Exploratory School middle level students participated in the junior division regional science fair. Robert Fretwell presented a project in the category of technology, John Shepherd in physics, Connor Gotham in energy, and Charlese Satterfield competed in animal science. Connor took first place in the energy division and Charlese won first in the animal science division. Charlese even went on to compete against senior division students for a shot at qualifying for the 2017 state science fair. Congratulations Explorers! Last Friday the Fremont Regional Wellness Committee conducted a community Blood Drive. CCHS teacher Andrew Fisher presented his concept for a video productions class to the board of education at a meeting in early February. At our board of education meeting on Monday February 27th we’ll hear more presentations about potential new high school class offerings. These will include Conceptual Physics, Technical Reading and Writing, Prostart, Teacher Cadet, Economics, JROTC Specials, United States and Colorado History, Advanced Digital Design and Drafting, and Vocal Music/Performance. Last Friday CCSD submitted two BEST grant applications in an effort to seek funding to support $58.5 million dollars in potential capital improvement projects for the Cañon City School District. One grant calls for building a new Washington Elementary School and a new Cañon City Middle School. The other would allow us to complete $10.1 million dollars in health, safety, security, building envelope, and learning environment improvements at CCHS, CES, Harrison K-8, Lincoln Elementary, and McKinley Elementary. If we are successful in receiving both of these grants we will get $38 million dollars from BEST in support of their completion. Our local match requirement will be a little over $20 million if we receive both grants. By early June we’ll know whether we got one, both, or none of them. At our board work session on Monday our board of education will finalize my annual evaluation, and based on the results of this will act on my employment contract at the board meeting afterward. 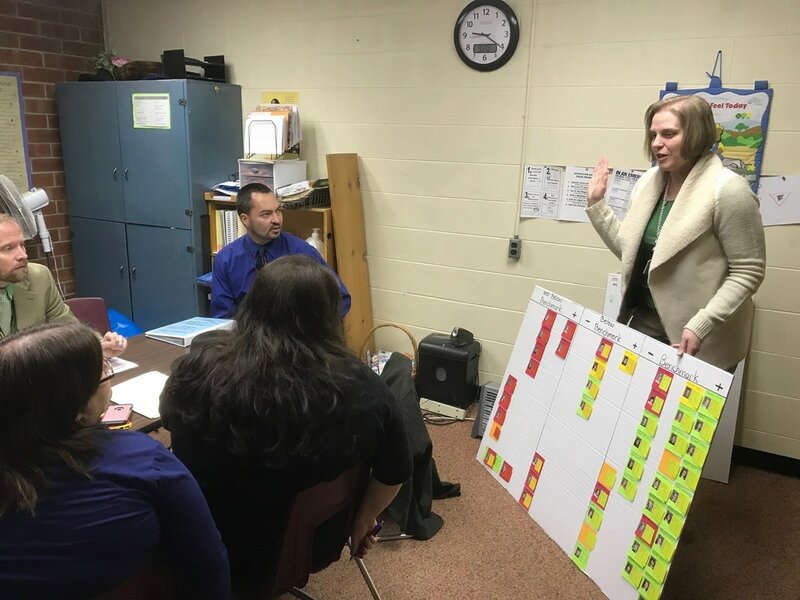 During the past several weeks we conducted mid-year evaluation visits at Washington and McKinley elementary schools, held a District Leadership Team meeting, and a Cañon 2020 committee meeting. I spent most of my time during the past two weeks working to finalize our BEST grant narratives, but also had the opportunity to attend a UCCS Educator Partnership breakfast meeting with director of human resources Misty Manchester and probationary teacher coach Jamie Davis. I also trekked up to Denver to attend an Early Childhood Leadership Commission meeting late last week. Administrators and consultants peek in on a class while conducting McKinley's mid-year performance evaluation. Literacy Coach Kelli Jones shares how Washington Elementary tracks student reading performance during their mid-year visit. During the next two weeks we’ll conduct mid-year evaluation visits at CCHS, CCMS, Harrison, and CES. I’ll also attend the CASB regional legislative engagement day with some of our board members. Other key happenings in the coming weeks include conducting our annual school calendar development committee meeting, another technology visioning meeting, and attending another Cañon 2020 committee meeting. We’ll also have an Expelled and At-Risk Student Support Services grant site visit by CDE taking place. For the past several weeks I have been sharing information about funding difficulties K-12 school districts in Colorado have been experiencing, and how this affects us right here in the Cañon City School District. It seems a simple answer to our problems would be to just ask our governor and state legislature to allocate more dollars to education. However, Colorado’s constitutional constraints caused by competing tax restricting amendments have created an environment where our leaders have been left powerless to generate revenues to fuel key state programs. Let’s start with Gallagher. The Gallagher Amendment, passed by voters in 1982, was designed to maintain a constant ratio between the tax revenue generated by residential and business property. An attempt to simplify a set of complex formulas, the effect of Gallagher has been to drastically reduce the percent of property value subject to taxation whenever residential property values increase faster than business property values. As a result, the assessment rate for residential property in Colorado has declined by more than two-thirds since 1982. This is the result of Colorado’s population growth coupled with increases in residential real estate values. 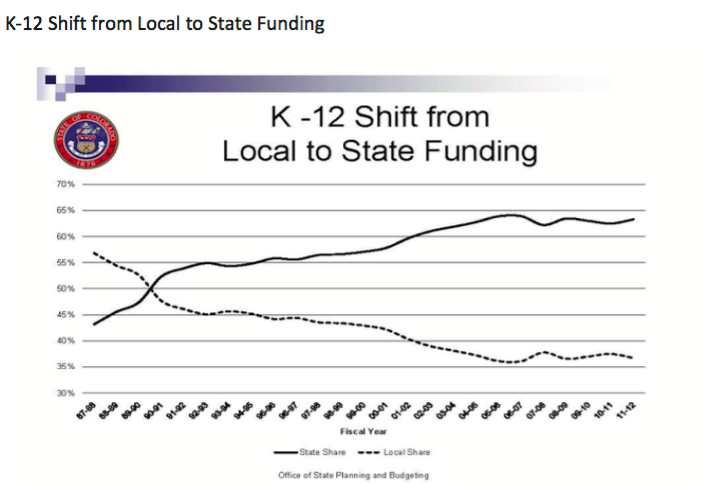 The has led to a steep decline in revenues collected from local property tax which, prior to Gallagher, provided the majority of school funding in Colorado. In fact, because of current economic conditions the Gallagher amendment will once again be driving down property tax revenues. Let’s continue with TABOR. The Taxpayer Bill of Rights was passed in 1992. It prohibits the enactment of tax increases without a direct vote of the people. Additionally, TABOR places strict limits on how much revenue the state can keep and how much it can spend. Colorado’s TABOR limits have established the strictest revenue and spending restrictions in the nation. As a result, any revenue collected in excess of TABOR’s formulaic limits must be refunded to the taxpayers. As explained in previous weeks, through the implementation of the school finance act Colorado’s schools are funded from a combination of local property taxes and state income tax and fee revenues. The formula established by Gallagher limits local revenues by ratcheting down the residential assessment rate. Despite this, from 1982 through 1992 school districts were able to make up for lower property tax rate assessments simply by adjusting their mill rates. Additionally, at this time the state legislature also had the flexibility to increase state spending to make up for losses in local property tax contributions. However, with the passage of TABOR in 1992 a combination of complex revenue restrictions made it increasingly difficult to fund our schools adequately. TABOR’s revenue limits automatically reduced mill rates in school districts across Colorado, and at the same time they limited the legislature’s ability to support school funding with additional state dollars. The result? Total per pupil funding in Colorado was unable to keep up with the Consumer Price Inflation Index during the 1990s despite the fact that Colorado’s economy was booming. In the end, the combination of both the Gallagher and TABOR amendments has shifted the burden of school funding from being paid for mostly by local property taxpayers to being covered by the state General Fund. Local property tax revenues covered 58% of total education costs back in 1987-88. They now only cover about 37% of these costs. It is my opinion this shift in where funding comes from has also shifted decision making power about how we run our schools from local communities to the state house and governor’s office. Add to this constitutional mess the passage of Amendment 23 by Colorado voters in 2000, which required the state legislature to increase K-12 per pupil funding annually by the rate of inflation plus one percent through 2011, and then simply by the rate of inflation thereafter. It’s intent was to also increase funding for specific categorical programs, such as special education and transportation, by the same percentage. Amendment 23 was simply designed to restore funding cuts that were experienced by public schools in the 1990s as a result of the TABOR and Gallagher interplay. Unfortunately, from its inception Amendment 23 conflicted with the Gallagher and TABOR amendments, as two of them worked to severely limit the increase of revenues while the other guaranteed annual funding increases to a specific portion of the state budget. With the arrival of the Great Recession in 2008, and the catastrophic reduction in tax revenues Colorado experienced, the legislature was faced with making a decision as to which of these constitutional provisions to abide by. Their choice? TABOR and Gallagher were to be enforced, and Amendment 23 was to be reinterpreted to include the establishment of the negative factor I have written about during in past installments. This constitutional interplay between Gallagher, TABOR is why the Cañon City School District must operate on 3.5 million dollars less than if Amendment 23 were enforced as was intended by voters when it passed.